Download a blank fillable Dd Form 2871 - Request To Restrict Medical Or Dental Information in PDF format just by clicking the "DOWNLOAD PDF" button. 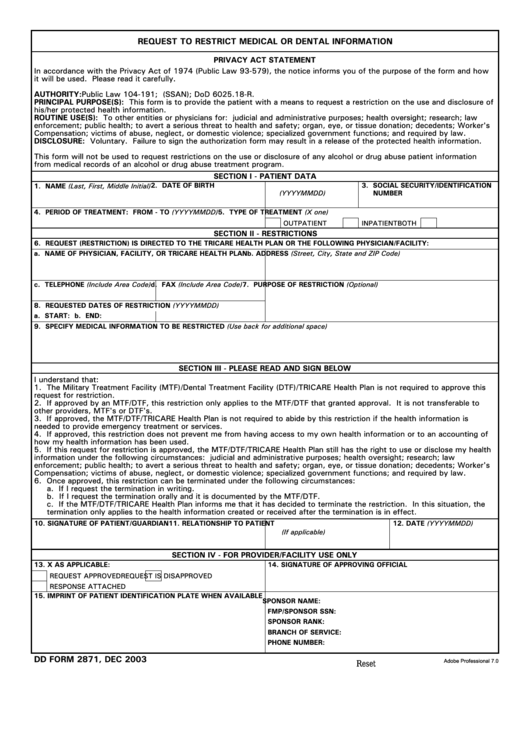 Complete Dd Form 2871 - Request To Restrict Medical Or Dental Information with your personal data - all interactive fields are highlighted in places where you should type, access drop-down lists or select multiple-choice options. Compensation; victims of abuse, neglect, or domestic violence; specialized government functions; and required by law. DISCLOSURE: Voluntary. Failure to sign the authorization form may result in a release of the protected health information. from medical records of an alcohol or drug abuse treatment program. other providers, MTF's or DTF's. needed to provide emergency treatment or services. how my health information has been used. a. If I request the termination in writing. b. If I request the termination orally and it is documented by the MTF/DTF. termination only applies to the health information created or received after the termination is in effect.